Loose Ends is the latest exhibition from Northern Irish artist Willie Doherty and is currently on show in Dublin’s Kerlin Gallery. The gallery itself has undergone an impressive refit to house Doherty’s signature video presentations – in this case a large dual screen projection. The latter half of the gallery has been sectioned off to create an intimate but spacious room for Loose Ends, an 18 minute diptych video installation. The other half serves as a foyer, albeit one with four beautiful prints taken from Loose Ends stills and presented in pairs to form two distinct pieces. 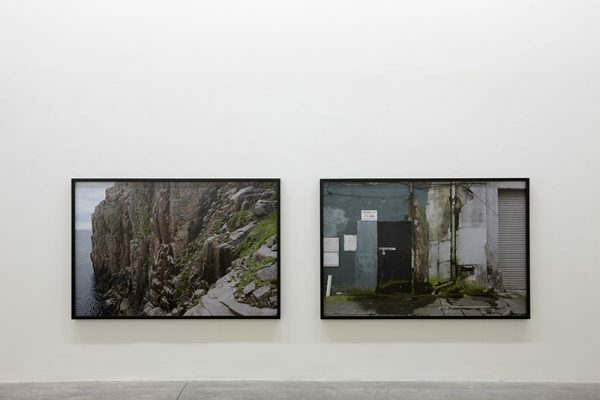 These provide the first introduction to the series and follow the same format of displaying views of Gola Island in Donegal and the capital’s Moore Street. Both provided key moments to the 1916 Rising – and as such the greater cultural and political shadow cast nationally in the century since the rebellion. As this centenary year of remembrance draws to a close there is no question which setting resonates loudest within the Irish psyche. While its significance, as with most historical secondary moments, has become a footnote in the broader historical tale of 1916, Gola Island provided a key moment in the build-up to the Rising. It was this remote Donegal island that was home to both Patrick McGinley and Charles Dugan, two of the six person crew for theAsgard during the 1914 Howth gun running. Loose Ends is accompanied by voiceover which is solemnly overlaid on the diptych projection. In this we hear tales of the Atlantic Ocean,of panic and fire, smoke and flames. A conjoined tale of both spaces but one that is also distinct from both – these places exist independently of each other but their histories are fundamentally entwined forever. Loose Ends is 18 minutes long, be sure to take that time and enjoy this wonderful and compelling exhibition before it closes.